Here’s a confession: Even though I blog about crafting all the time, I have to admit – I’m really not good at planning ahead when it’s time to give gifts. I’ll want to make a big, impressive, straight-from-the-heart homemade craft project, but run out of time and end up grabbing a gift card the day before. It can’t just be me who has this problem, right?! 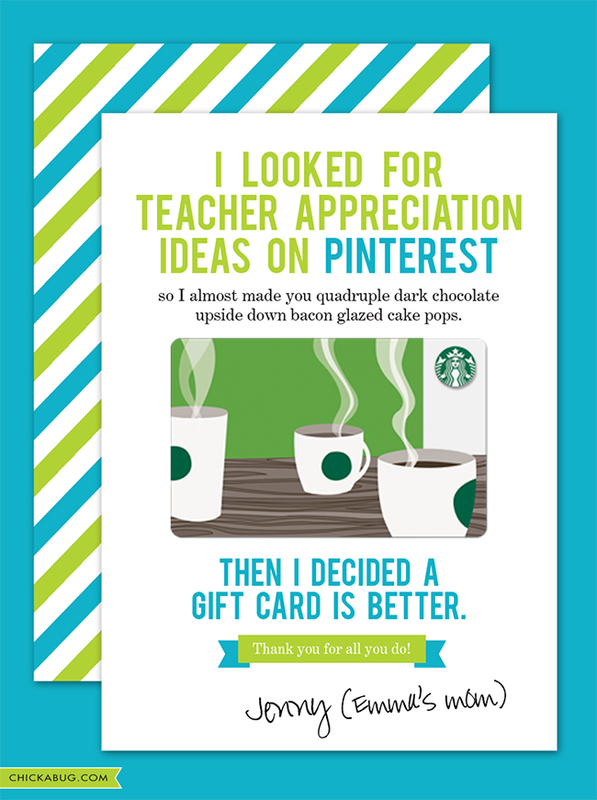 So, for this year’s Teacher Appreciation Week, I decided to make a printable that’s good for all us crafty wannabes – the gals who love Pinterest but just can’t seem to make it to Michael’s. And, for us gals who have a sassy sense of humor. 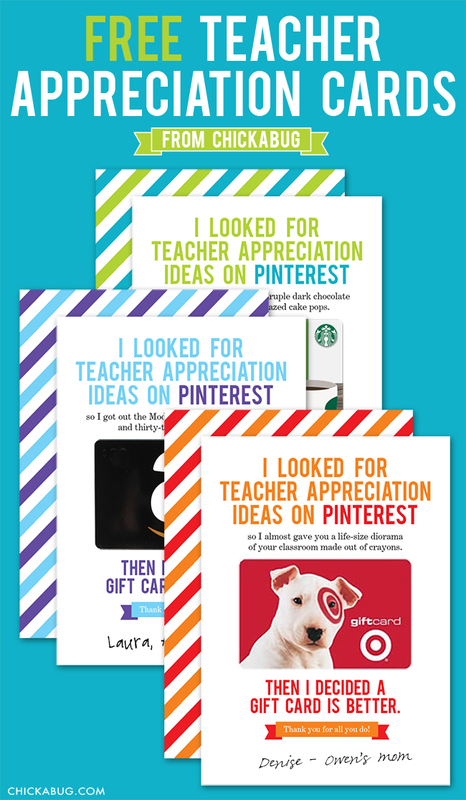 ; ) Without further ado… here are my free printable teacher appreciation cards! There are three designs so you can pick your favorite saying, or give them to different teachers. And of course, making these cards is a cinch – just print the design of your choice onto white card stock, cut the cards out, and glue the back to the front (to add that extra-snazzy patterned back). Stick on your gift card, and you’re good to go. If you need an envelope, these fit a standard A7 size envelope… or just go without an envelope, I won’t tell! These are awesome! Thank you for the freebies. Too funny. LOVE these...especially as someone who used to be a teacher and always considers Pinterest as good ideas at the time...but who has the time. :) Too funny! LOVE this idea! Thanks so much! We are on vacation that week and I was already figuring out how to get it done before then. Perfect! These are hilarious!! I love them! Hi Michelle! I just tested out the link and it's working for me. Eek! Maybe you could try again, or on a different computer? I can't get it to print correctly. It prints out much smaller than a 5x7 and the gift card covers up the writing. I am sure it is user error...ugh. They are so cute. And, Thank you so much for the free cards! I really appreciate it! And, I love your stuff. I'm having the same problem. What did you do to fix it? This is perfect! I can only imagine how many useless crafts teachers get when what they could really use is more Clorox wipes and tissues to replenish supplies and something that they actually want. Love it!! Thank you so much for this! I printed two of the gift card holders from Chickabug--perfect timing. Sorry--I thought I was commenting on the big roll-up of Teacher Appreciation Day printables that I googled for. But hey, out of the 20-odd ones on that post, I chose yours as my favorite. :-) Thanks again! Best accidental comment ever!! ; ) Thank you so much, that just makes my day! These are fabulous!! Thank you for saving me from just giving a boring gift card in a thank you note!! Heather, thank you for the laugh and for saving my bacon today! 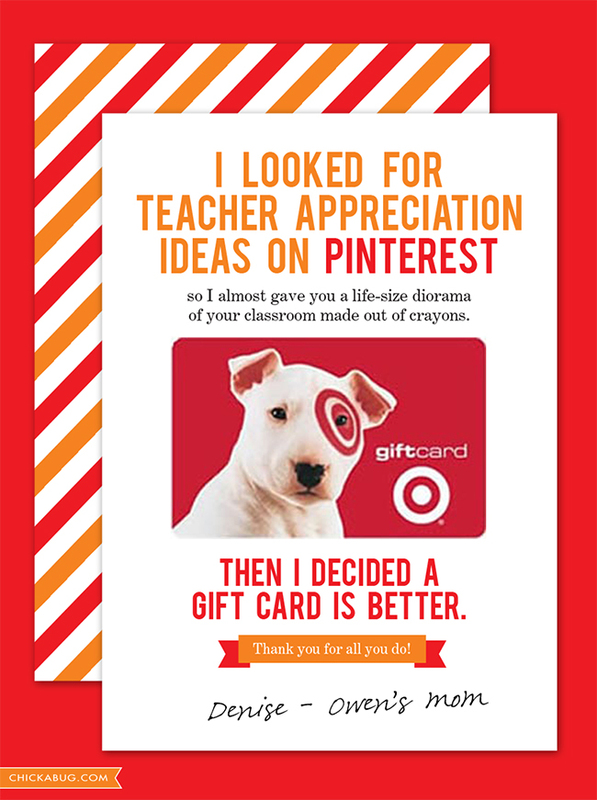 Paired with a printable gift card, I was able to give some appreciation to my children's teachers! And I totally hear you on the planning ahead! 'Saving my bacon' is officially my new favorite phrase! ; ) I'm so glad these came in handy - thanks Priscilla! our teachers LOVED this!! thanks for the free download ... thrilled to have found you! Heather - these are seriously awesome!!! LOVE!! Wonderful idea! Thank you so much. I LOVE these and will be using them for from daughters' teachers! Thank you! And, as a former classroom teacher, gift-cards and homemade thank-you cards are ALWAYS the most appreciated! I love these so much! I just printed them to give to my son's teachers tomorrow. These are great! Just my style. Thanks so much! Your free printables just saved my day! It's the last day of preschool but it slipped up on me! I had full intentions of making a life size recreation of Hadley out of play dough for each teacher but totally ran out of time... so I used your adorable gift card cards instead... I'm sure they won't mind. ;) Thanks for making the time to design these adorable cards and then offer them for free!! Thanks again & again! 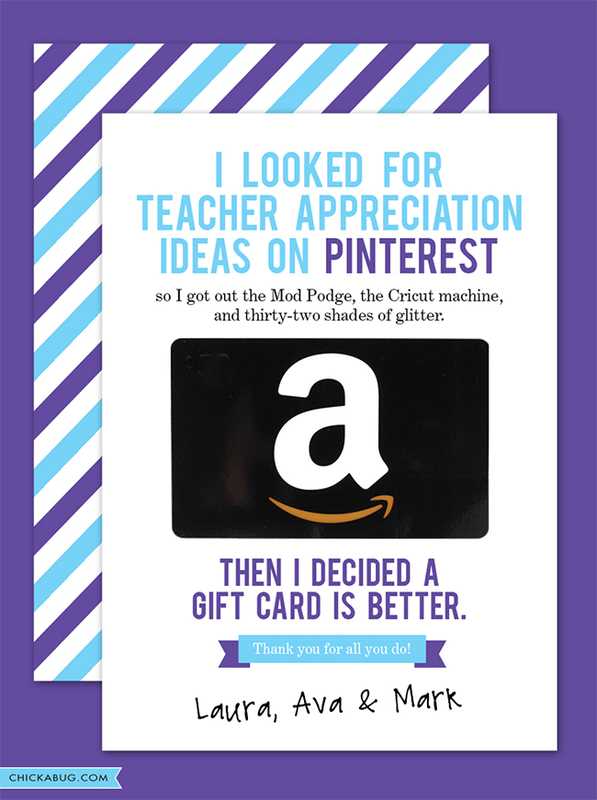 I pinned this for Teacher Appreciation week, but never even pulled this easy one off! Luckily, it works for end of the year gifts, too! I love these! When I click your link it pulls up a PDF and when I print the font changes and the spacing is weird. Help! Using these today! Ran out of time for a Pinterest project. Thank you, Chickabug!!!! I found these on Pinterest and laughed so hard! I love it! Thanks for sharing something even I can pull off! I literally laughed out loud when I saw these! THANK YOU for speaking every panicky, end of school year mom's anthem! These are hilarious and so so true!! These are AWESOME! I am preparing for our teacher appreciation week and these really are inspiring. My son is trying to top these and truly make them personal for his middle school teachers. I can't stop laughing they are so funny. Thanks! I love these printables! Thanks for offering them for us non-creative types! I have a question...I printed out the teacher appreciation for the gift cards and the there doesn't seem to be enough space in between the text for the gift card (the gift card covers the text). Is there a way to put more space in between? Thanks! You must not be printing at 100% scale - there's definitely enough room. : ) Open your file in Acrobat Reader (get.adobe.com/reader) and choose "Scale to page = none" when you print. Thank you for your awesome printables. They saved the day! So adorable and funny! PERFECT. These are perfect. Thanks for the tip! These are fabulous! I am a teacher and laughed out loud at each one. I am printing to give to my children's teachers for their holiday gifts. They will love them, too! These are so cute and perfect for my very last teacher appreciation week of elementary school! Sad but a little bit giddy that I won't have to keep up with the Pinterest moms anymore. Hello middle school! Thanks so much for posting these. I would love to look at your printable cards. Looking forward to the free printable! I love the teacher appreciation cards. I am such a pinterest wannabe, but can't find the time not have that same artistic flair. These cards are perfect. I truly was going down the Pinterest path . . . thank you for saving me from an horrific Pinterest fail! Now I'll get an A+ for sure! Thanks for the free printables! These are perfect, thank you! More power to the moms who are super crafty and make all kinds of stuff off of Pinterest - I'm not that cool. Super creative gift card holders! That's exactly what I did. Thank you! Awesome idea. I can't wait to hand them out. Hi Sheila! When you joined the VIP list you got a message from shop(at)chickabug.com. Look for that or search “Chickabug” in your email and it will come up. The email has the link to the free downloads. I hope this helps! Thank you for the freebies we appreciate it. These are super cute! As a teacher, I would love to get them! I love these printables!! Thank you! Thanks for helping me APPRECIATE my staff! These are hilarious...and too true! hello,I REALLY liked your ideas.could you please send me the link to download the stick notes for post it?thank you SO MUCH.